Shrimp season is from May to December and no summer in the south is complete without a Louisiana Seafood Boil where you roll-up your sleeves and put out a pile of paper napkins and let the mess begin! Another southern favorite is shrimp and grits, the iconic breakfast meal for coastal fishermen and communities, although the people living in and around Charleston, North Carolina have been known to make it a mainstay of their diet for decades. I bookmarked this recipe from one of my favorite food blogs: The Duo Dishes, who describe themselves as ” just two people who love to cook, love to eat and love to talk about cooking and eating”. This post found them reminiscing about family and friends and the traditional southern comfort foods that defined celebrations through their days at University of North Carolina, Chapel Hill. 1. In a large bowl, carefully mix all of the ingredients except the breadcrumbs, seafood seasoning and butter. Form into 4-6 patties and set on a baking sheet. Chill for an hour. 2. Once chilled, cover all sides of the patties with bread crumbs and lay on a separate baking sheet, lightly sprayed with oil. Bake in an oven preheated to 375 degrees for 15-20 minutes, flipping once. 3. If desired, top with a dab of butter just before removing from the oven. Serve on warm buns. 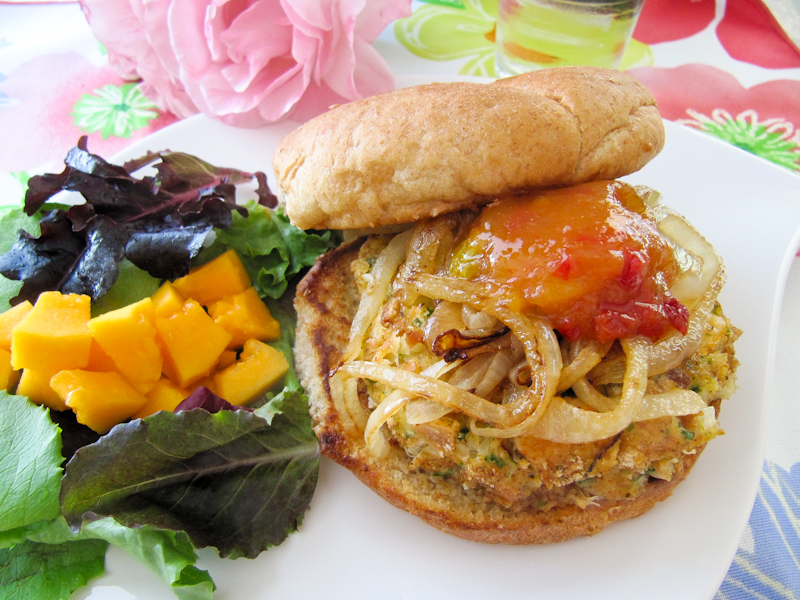 Shown topped with carmelized onions and a spoonful of mango chutney alongside organic spring greens and chopped papaya. * I followed Duo Dishes recipe closer than I follow most, but I did cut it down to make 4-6 burgers, rather than 8. I also cut down on the heat a bit and the amount of chopped onions (personal preference). The spill will affect many popular commercial seafood species and the people who depend on them for a living: wild shrimp from the Gulf of Mexico and South Atlantic; snappers caught in the same waters; wild Eastern oysters; groupers; U.S. farmed oysters; and U.S. farmed shrimp. You can support beleaguered fishing communities when you select Seafood Watch Best Choices and Good Alternatives from the Gulf. You can also download a seafood watch pocket guide . Oh my! These look so yummy! I want this for dinner tonight! I’ve had a crab-cake burger, but this looks even better. 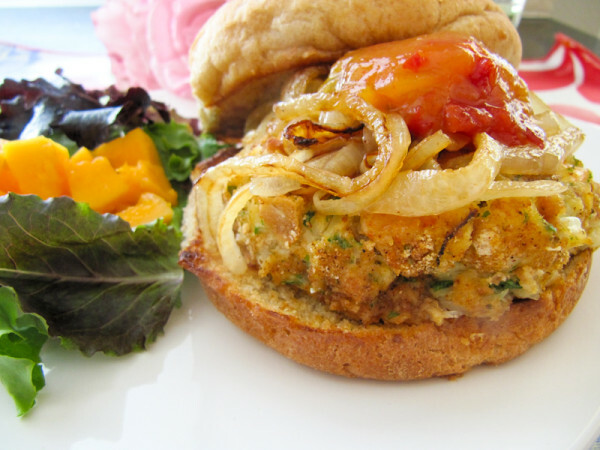 I have never had a crab/shrimp burger, but now that you have written this post…it is the only thing I want! I can’t wait to move down to Texas this week so that I can get my hands on some good shrimp and support the fishing community..one of my favorite memories of growing up was visiting my grandparents in Houston and eating a huge plate of shrimp. .-= Monet´s last blog ..Pie Time =-. ” The Duo Dishes” blog too. And thank you so much for the link, the oil spill has so many concerned for so many reasons, and one being the safety of foods prepared for our family. Again, excellent! .-= Magic of Spice´s last blog ..Whats for Dinner – Layered Savory Salmon Cheesecake =-. Mmmmm, I love crab. So sad about the oil spill. Thanks for bringing the fishing communities to our attention! .-= Heather I.´s last blog ..Pluot Snack Cake =-. Monet – you will be able to get great Gulf shrimp in Texas. You must try them and let me know. Happy trails to you in Longhorn country! Heather – Thanks for visiting, now I have to see your Pluot Cake! Thanks for testing our recipe! We loved our ‘lil burgers. You topped them so nicely too! The mango chutney is perfect, perfect, perfect! .-= The Duo Dishes´s last blog ..A Trip to the Tropics =-.